In spite of their different backgrounds, languages and cultures, ninety percent of corps members who make it to the orientation course share something in common --- the desire to be posted to any of the major cities of their states of deployment. Such desire is instigated by either the security consciousness of the corps members since they are posted to states other than theirs or the need to quickly get access to some basic amenities, such as electricity, pipe borne water, financial institutions etc., which might be out of sight in most villages. Having this in mind, these corps members spend most of their days in camp trying to make arrangement that will land them in their choice cities. This arrangement could be legal or illegal, but this article reveals the legal means of getting posted to the capital or any of the major cities of corps members' states of deployment. The Orientation Broadcasting Service, popularly called OBS, is the voice of NYSC. Like every radio station, it disseminates information and keeps corps members in camp entertained with other hilarious programmes. It has the technical unit (made up of technicians), reporting unit (reporters) and the broadcasting unit (comprising the newscasters and presenters). To join the Orientation Broadcasting Service, you must be skilled in writing, on-air presentation, newscast or technical operations. 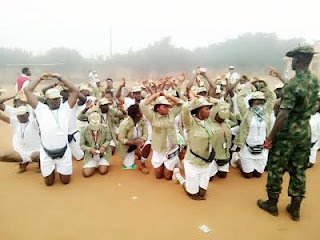 In order to reduce the numerous number of corps members who indicate interest in joining the service, interested corps members are interviewed and subsequently accepted based on merit. The truth of the matter is that successful corps members are posted to the state's capital at the close of their orientation course to form the Editorial/Publicity CDS group of that batch. One thing you can never run away from while in camp is the boring Skill Acquisition and Entrepreneurship Development (SAED) programme/lectures. Corps members are expected to participate in this programme. It is a programme introduced in 2012 in request to the transformation agenda of the federal Government which lays emphasis on entrepreneurship and self reliance, especially among the youths. The areas of training include Cosmetology, Food processing and preservation, Agro Allied, Culture and tourism, Information and Communication Technology (ICT), Construction, Power and Energy, Film/Photography, Environment, Horticulture and Landscaping, Education and Automobile. Although the SAED committee is headed by NYSC officials, corps members are key players in the day-to-day organisation of the programme while in camp. The efforts of these corps members are not thrown into the mud as they are duly compensated through posting. They are posted to the state's capital or its equivalent. In camp, there is an inter-platoon sport competition, and members (players) of the winning team(s) are usually posted to the state's capital to form the Sport CDS of that batch. This CDS group represents the state's NYSC in any interstate or intrastate sport competition. If you are good at any sport, especially football, never hesitate to join the sport team of your platoon. It might be the winning team. There are corps members who will neither bribe nor belong to any of the aforementioned groups but will still find themselves in the state's capital at the end of the orientation course. These corps members are referred to as the lucky ones. Either fate or incessant prayers can make you achieve this. In sum, just being a member of either of the aforementioned groups does not make your posting to the state's capital automatic. You must be hyperactive in the group you belong! I wish you a fun-filled camping experience!